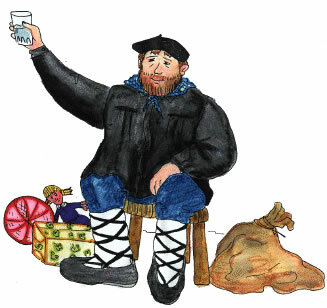 Why the Basques don’t need Santa Claus – And Why Not! Doctor and mom blogging about medicine, life in medicine, parenting, work, fashion, food… and whatever else comes up. As an outsider looking onto what is completely routine and normal in the town of Portugalete, of Bizkaia, País Vasco, España, I note things to myself that people here take for absolute granted. For example, I am constantly aware of the ethnic pride-slash-mild superiority complex that perfumes the air. I get it: it’s partly reactionary after decades of oppression from Generalissimus Franco, partly fanatical in some cases – we all know about ETA – partly completely normal for any tight culturally bound group. Aren’t we all a chosen people? In Spain, they celebrate Christmas like anyone on the 24th/25th, but give presents on the 6th of January, when the reyes (I don’t know who they are, exactly, but it’s in the New Testament, and in ALL the paintings) come to see baby Jesus, adore him, and bring the gifts, ie the Nintendo Wii, the new iPod, house slippers, power drill, or whatever. Here, in the Basque country, though, the reyes, Santa Clause and the whole Christmas crew take a break. Here we have the Olentzero. He is WAY Basque. Dressed in the customary sheepherder aldeano outfit, with a pipe and a drink (of course) he is paraded down the main street of each town (7pm in Portugalete, 8pm neighboring town of Sestao, 9pm in the next town of Barakaldo etc), followed by various Basques bearing flags, then a small herd of sheep, then some pigs, then some castrated baby bulls, then a bunch of kids also all dressed up in the ethnic outfit with Bengal lights and torches (fake, I hope, but I fear that not). The adults cheer, toast champagne, txikitos, and martinis, and everyone is ecstatic. Where is baby Jesus in all this? Who knows. Who cares. So that’s what I did yesterday. I watched the parade, and toasted and played with other people’s kids. I kept looking around for someone with whom to share the wonder of this whole ordeal. I WISH I could communicate what this felt like!! But it’s what they do every year. Nothing odd. Who needs THEIR commercial Santa. We are from Bilbao. We’ve got our own. He’s a shepherd. He’s got wool socks, a boina (the beret), a pipe, a drink. He ain’t getting burned. Watup, Vascos. hahaha, thanks!! El Olentzero comes on the 24th/25th – climbs in through the balcony. Reyes Magos come on the 6th. My niece and nephew are so super lucky b/c they celebrate the Olentzero with their grandmother in the Basque country, then go home to Madrid and do Reyes there. so. many. presents. It all sounds so interesting!